Why Are They Called Sloppy Joes? Are they called sloppy joes all over the United States? Today’s Wonder of the Day was inspired by Rori. Rori Wonders, “Why is a sloppy joe called a sloppy joe” Thanks for WONDERing with us, Rori! What do you get when you combine ground beef, onions, tomato sauce or ketchup, and seasonings on a hamburger bun? If you guessed a sloppy joe sandwich, you're right! Sloppy joes are an American creation that has been around since at least the 1950s. They probably got their start as a variation of the “loose meat" sandwiches that were popular at that time. “Loose meat" sandwiches didn't contain tomato sauce. According to legend, a cook named Joe at Floyd Angell's café in Sioux City, Iowa, added tomato sauce to his “loose meat" sandwiches and the “sloppy joe" sandwich was born. And the rest, as they say, is history! Sloppy joes are popular with most children and are a favorite in lunch rooms in schools all over the country. They're also a favorite of parents when dinner time approaches, since sloppy joes are easy and inexpensive to make. You can use a homemade recipe of ground beef, onions, tomato sauce or ketchup, and seasonings. Fry up the ground beef, add the other ingredients, and serve it up hot on a bun. 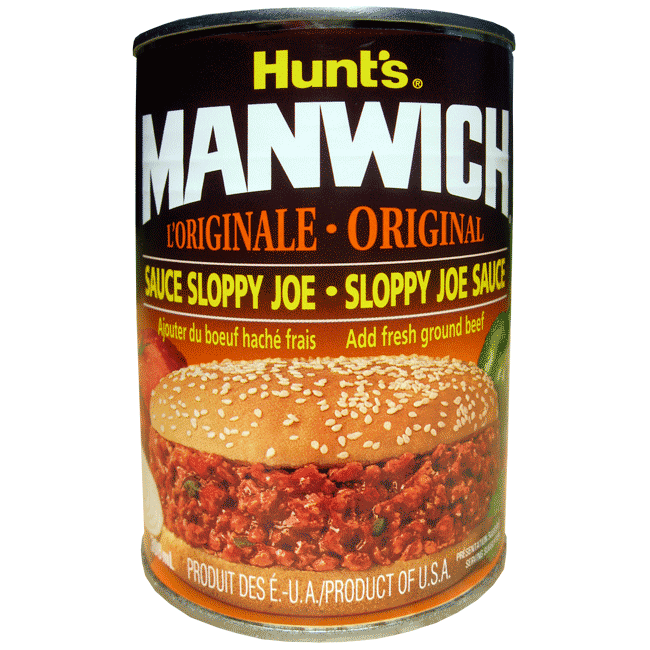 For your convenience, you can also use a canned product, such as Manwich, that already has most of the ingredients already mixed together. All you need to do is add ground beef! If you're a vegetarian, you can substitute vegetable protein for ground beef to make meatless sloppy joes! Many people find the name “sloppy joes" to be rather funny. Would you believe that sloppy joes are often called by different names in different parts of the United States? It's true! Some other names for sloppy joes include: barbecues, dynamites, gulash, sloppy janes, slushburgers, steamers, wimpies, and yum yums. What do you call sloppy joes where you live? Just like the many names for sloppy joes, you'll also find all sorts of variations on the traditional recipe around the country. Some areas use other meats, such as chicken, instead of ground beef. Other areas add special spices, like cinnamon and brown sugar. How do you like your sloppy joes? Tomorrow’s Wonder of the Day may be a bit dim, but it’s sure to brighten your day! Pretend you're a chef at an upscale restaurant. Your specialty is sloppy joes, but you're worried your customers will cringe at the name. Can you think of a better name for this delicious sandwich? Put on your thinking cap and come up with a few alternative names for the sloppy joe that sound a little less messy and a little more appetizing! The sloppy joe is a favorite sandwich of many people. What other sandwiches do you enjoy? When you're on the run, sandwiches are handy to eat (pun totally intended!). If you could eat any sandwich right now, what would it be? Ask your friends and family members to share their favorite sandwiches with you. Maybe you'll find a new favorite! Glad you learned that fun fact, Karter! I ran across MANY people in Cedar Co, Nebraska who religiously refer to Sloppy Joes as "Taverns". I found it odd at first, but then it struck me as really odd when I just read that the Sloppy Joe was born in Sioux City, IA, a 45 minute drive for most of Cedar Co. Any explanation and has anyone else ever heard of this term? Thanks! Great article. It all makes sense now! My friend always says when I'm feeling sad "Hey have you ever met sloppy joe? You probably don't want to becuase he's REEEEAAALLLLYYY sloppy. And he has a freind named attle and he goes to Se-attle alllll the time!!" It cracks me up every time. I grew up in Sioux City, Iowa where the Sloppy Joe originated. We also refer to them (the Sloppy Joe) as "Taverns." The Wonder Really Freaked Me Out!!!!!!!!! Wow, lots of comments. I loved it. It looks so good. Why do cats go, "meeeeeeeeeeow"? That's my guess. :):):):):):):):):):):)LOL! We were wondering why you use the celery leaves in the recipe for slopppy joes. Here in Australia, we cut off the leaves of the celery. Today's wonder made me HUNGRY!!!!! Thanks for the wonder!!!! I think tomorrow's wonder is "why cats meow?" I wonder why it is called sloppy joes? I wonder if it is yummy? I wonder if it is supposed to be hot or cold when you eat it? Wow! That recipe almost made me throw up! Ew! Oh, and I think tomorrow's wonder is about cats doing tricks! Hi wonderoplis. Me and Prabh are huge fans. We liked all your wonders. We thought if you guys could post of bridges because we are learning about bridges. What makes the sloppy joes look brown? Hey wonderopolis, all I have to say is I knew it! I knew it! I said it... I knew it!!!! Hi again, just found the answer to our question! Thanks again for all you do to keep learning fun. Thank you for today's wonder. Most of our class loves VERY SLOPPY sloppy joes! We even like to scoop up the extra slop with chips. Yum. We have a wonder question for you: How do we preview the next wonder of the day or make a guess. We have read lots of posts about cats and are wondering were they see that. Thanks again- your friends from Buffalo, Minnesota. Hi, wonderopolis. I am in Mr. Draper's class. I like today's wonder. Can you give me another hint about tomorrow's wonder? I am sick, that's why I am not at school. I like your website very much. I like going on your website at school. Thank you for all your great wonders. I sure hope you have a great comment back. See you tomorrow. I think tomorrow's wonder is how cats meow. Ms. Gentile's 4th graders like them EXTRA sloppy! I think todays wonder was AWESOME! I think it's called a sloppy Joe because it is very sloppy and Joe for its creator. I'm going to karate with my aunt brother and cousin today. We're just looking at it to see if it is the right class for the 3 of us + I love wonderopolis I go here every day! :) :) :) :) :) :) I LOVE IT! Me and Elizabeth love sloppy Joes. How about you Wonderopolis? Wow, my favorite dish. My sister would always prepare Sloppy Joe sandwiches and French Fries for me during my home visit from college. This sandwich was named Sloppy Joe because it's so sloppy. Perhaps it was named after its creator, Joe? My class loved all the different names for a sloppy joe...especially sloppy jane! We wondered if this was Joe's wife!? Some of us don't like sloppy joes and want to call them yuck yucks not yum yums. The rest of our class thinks they are DELICIOUS! Can you make sloppy joe's in many different ways? Does the cafeteria at Wonderopolis ever serve sloppy joes? We think tomorrow's wonder is about why cat's meow or why they hate water? Have a very SLOPPY DAY! It would be very funny if the person who invented Sloppy Joe's was named James and then it would be a Sloppy James. Why is called sloppy joe? I just told mom last night that I will never eat a sloppy joe again ( I DO NOT LIKE SLOPPY JOES! ). SO, that's funny that it is the wonder today! I think tomorrow's wonder is gonna be about why cats meow! NOOOO!!! I WAS WRONG! :( Oh well, maybe next time. This was an awesome wonder! I think it is WONDERful! :D I think tomorrow's wonder of the day is about cats. Sloppy joe sandwiches originated in which country? Sloppy joes got their start as a variation of what type of sandwich? aham and cheese Not Quite! Which of the following would you probably NOT use to make sloppy joes?